Rumors Lead To Day Of Confusion In Edward Snowden Search : The Two-Way After a day of ambiguous statements, confusion and a rerouted plane carrying Bolivia's leader, it seems the U.S. is no closer to pinning down the location of Edward Snowden, the fugitive former security contractor who is desperate to find asylum. 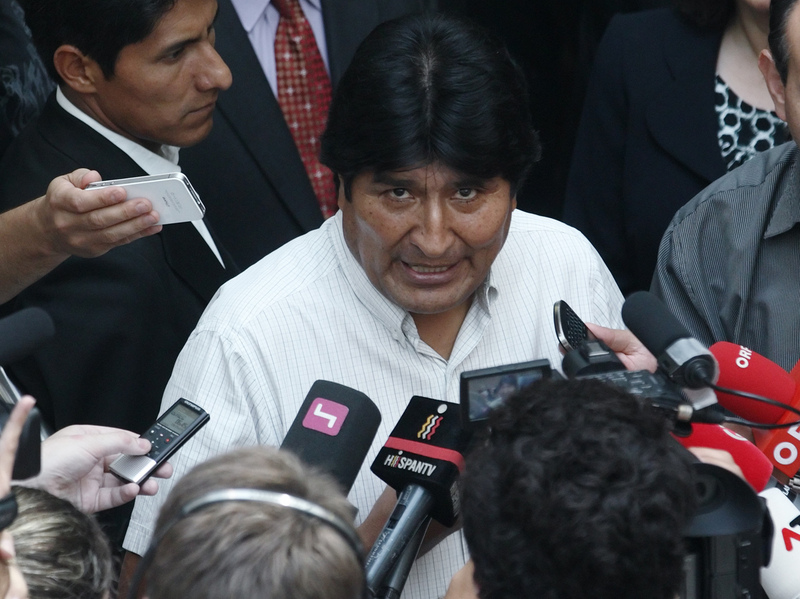 Bolivian President Evo Morales talked to journalists at the Vienna International Airport on Wednesday. Bolivian officials accused the U.S. of pressuring European authorities to ground the plane, which had taken off from Moscow. It was rumored that "NSA leaker" Edward Snowden might be on board. Update at 6 a.m. ET, July 3. Bolivian Leader's Plane Takes Off. "Bolivian President Evo Morales' government plane took off from Vienna on Wednesday after an unscheduled overnight stop, an airport spokesman said without giving more details. The plane was forced to land in Austria after France and Portugal abruptly cancelled air permits for it while en route from Moscow on Tuesday, apparently due to fears fugitive ex-U.S. spy agency contractor Edward Snowden could be on board. Bolivian and Austrian officials denied this." After a day of ambiguous statements, confusion and a rerouted plane carrying Bolivia's leader, it seems the U.S. is no closer to pinning down the location of Edward Snowden, the fugitive former security contractor who is desperate to find asylum. As Mark reported earlier, Snowden, with help of WikiLeaks, had sent out requests for asylum to some 20-plus nations, including China, Austria, Germany, Venezuela and Bolivia. Snowden is currently believed to be in a Moscow airport transit area awaiting word that one of these nation will harbor him. Speaking to reporters in Moscow, where he was attending an energy conference, Bolivian President Evo Morales said that his South American nation would be willing to consider granting asylum to Snowden. "It escalated into a major diplomatic scramble in which the Bolivian president's plane was rerouted on Tuesday because of suspicions that Mr. Snowden was aboard. "By day's end, outraged Bolivian officials, insisting that Mr. Snowden was not on the plane, were accusing France and Portugal of acting under American pressure to rescind permission for President Evo Morales's plane to traverse their airspace on the way back to Bolivia. Low on fuel, the plane's crew won permission to land in Vienna. "They say it was due to technical issues, but after getting explanations from some authorities we found that there appeared to be some unfounded suspicions that Mr. Snowden was on the plane," the Bolivian foreign minister, David Choquehuanca, told reporters after the touched down in Vienna, where Mr. Morales was spending the night." Choquehuanca said they didn't know "who invented this lie," and added that the rerouting of Morales' plane was an injustice and that it put the president's life at risk. Also in Russia, Venezuelan President Nicolas Maduro dodged the question of whether his nation would grant asylum to Snowden if requested. But he also defended Snowden's actions, reports The Associated Press. "Who must protect Snowden? This is the question. This young man of 29 was brave enough to say that we need to protect the world from the American imperial elite, so who should protect him?" Maduro said in response to a question from journalists at a ceremony to rename a Moscow street after Chavez. "All of mankind, people all over the world must protect him." Snowden also withdrew a bid for asylum in Russia. President Vladimir Putin had set terms Monday that he was ready to shelter Snowden so long as he stopped leaking U.S. secrets. Putin, however, also said he had no plans to turn the former National Security Agency analyst over to the U.S.